Almaty may have lost the Olympics, but people like it better than Astana. Some recommended reads for the weekend. The decision is a blow to long-term president Nursultan Nazarbayev’s image-making project for Kazakhstan, which had hoped for the spectacle of the Winter Olympics as the crowning glory of the country’s rise from impoverished post-Soviet backwater to a dynamic, emerging player on the world stage. Almaty hasn’t been the capital of Kazakhstan since 1997 but the current capital, Astana, is “one of the strangest capital cities on Earth” according to a profile by Guardian Cities. “Of all places, why put a city here?” the profile begins. 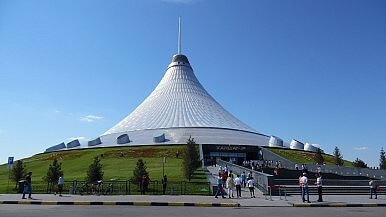 Astana may be a planned city, but it leaves much to be desired, the authors say. Astana “comes glistening into view, all shiny metal and glass, implausibly rising up from the Kazakh steppe like some post-modern lego set that has stumbled into the opening sequence of Dallas.” (Dallas is an old American soap opera set in Texas. Its opening credits feature shots of the city of Dallas rising out of the flat Texas plain.) Astana is filled with architectural wonders: a shopping mall shaped like a tent, a glass pyramid, a presidential palace that is more like “a Disney version of the White House” to mention a few. The profile digs a little into why the Kazakhs decided to relocate the capital and why few were happy with the decision. Almaty, Olympic loss aside, remains the country’s largest city and decidedly more popular. In Tajikistan, where a group of half-naked Russian soldiers got into a drunken brawl with some local Tajiks earlier this week, there is an on-going debate about whether the Russians are welcome or not. On GlobalVoices, Abdulfattoh Shafiev, dives into Facebook comments (always dangerous territory) on the RFE/RL story that broke news of the incident. RFE/RL is funded by the United States, a fact that made the story seem, to some, to be a provocation. Other commenters advocated closing the base and locals have previously complained about live-fire exercises disturbing the community. The bottom line is foreign soldiers are not always great guests or neighbors. How Does Kazakhstan Plan to Pay for the Olympics? Astana says there's plenty of (oil) money in the bank. Competition for the 2022 Winter Olympics Heats UpIn Kazakhstan, Hope and Skepticism About Hosting 2022 OlympicsKazakhstan’s Top Party Picks President, Meanwhile the Youth Debate the FutureIs This the Closing of the Kazakh Window Into Xinjiang?Who Will Run Post-Nazarbayev Kazakhstan?